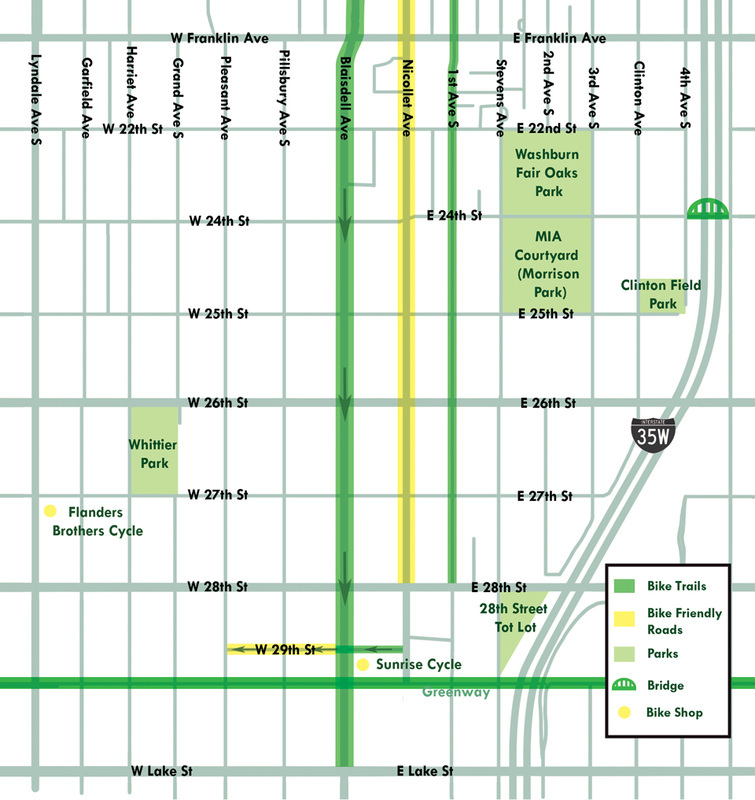 The best piece of bike infrastructure in the neighborhood is the Midtown Greenway, which is a great asset for cyclists in Whittier who need to go east or west. For those who need to go north, First Avenue has a narrow bike lane that will take you to LaSalle Avenue Downtown. If you’re heading south, Blaisdell Avenue has a decent bike lane. The 24th St pedestrian bridge has stairs on the Phillips side of the bridge but they do have a wheeling ramp if you’re feeling strong and mighty! Whittier is a dense neighborhood, with a shortage of parking and a sometimes confusing scattering of stop signs. We regularly advocate to Public Works to make our streets safer, so if you have feedback about intersections or road signage, please get in touch with our office. We are also fortunate to have a great bike shop in the neighborhood on Lyndale Avenue, Flanders Brothers Cycle; if you need a bike, bike parts or a repair job, remember to shop local and keep this excellent business within our community. Thankfully, Whittier hosts quite a few bus routes and the frequency of service has been increasing in recent years. The I35W/Lake Street reconstruction project is also intended to add a hi-frequency bus station at the Lake Street intersection. The Number 18 bus runs down Nicollet and provides a convenient link between Downtown, Eat Street and Bloomington. The Number 2 bus runs along Franklin and can take you to the U of M via Cedar-Riverside; it is now a hi-frequency line. The Number 11 bus runs along 3rd avenue, and travels from Columbia Heights to 46th Street. Number 4 and Number 113 run along Lyndale Avenue, and can take you to Southtown Shopping Center and the U of M, respectively. Number 21 and Number 53 both run east-west along Lake Street and will take you to Downtown St Paul.